Born and raised in Wisconsin, USA, Stephanie Roble started sailing scows and dinghies at age five. She went on to compete in high school and college, and now spends most of her time in her new hometown of Miami, FL. 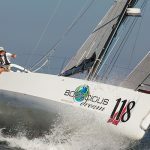 There, she is sailing and training in the 49erFX class for the 2020 Olympics, as the skipper of Roble/Shea Sailing. 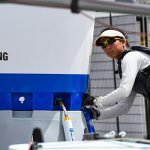 We caught up with Stephanie following her return from the World Cup Series in Enoshima, Japan – the sailing venue for the Tokyo 2020 Olympics. How many days a year are you currently on the road? Too many! It’s around 175-200 days/year on the road, maybe even more. I try not to count or think about going home until it’s time to go back. I believe it’s important to be present in what you’re doing! How do you implement sustainability in your daily life when traveling that much? I always travel with reusable bags, water bottles for on and off the water, protein shakers and bamboo cutlery to use at my destination. Maggie and I are very conscious of our trash in and out of the boat park and make sure it all goes in the right bins. We try to eliminate single-use plastic whenever possible. However, being on the road and in different accommodation means eating on the go. It is inevitable to get your food in plastic bins or use a plastic cup on the plane. I always skip the plastic bag, the straw and bring my own food when I can. With all of this travel, what’s the most significant ocean health problem you have witnessed? The saddest thing for me is that not a day goes by when we don’t see trash in the water. Sure, some places have less visible debris in the water than other places. But there is still all the waste and microplastics in the water that we can’t see. I know that what we do on land has a direct impact on what goes in the water. It is amazing when you walk through a boat park how much trash and plastic water bottles end up not in the receptacles. We as sailors need to step our game up! Have you seen any exciting changes in the sailing community or innovative solutions in other countries when it comes to sustainability? I was impressed with Aarhus, Denmark as a whole. The city is super clean, everyone rides their bikes all year round, and they live simply. The volunteers for the World Championship had a lot of pride in keeping the venue clean. They had bins for every kind of trash and explanations on how to use them. People were walking around cleaning up the boat park. We found a cool eating hall that had about 30 different vendors with food to go. All the glassware was reusable, the boxes were compostable, and the cutlery was bamboo! What’s the most significant difference for you going from professional sailing to Olympic campaigning? 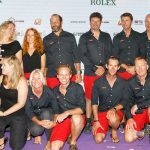 I am so grateful for all the experiences I had with some successful teams in professional sailing. Besides from stepping into the helm position as a crew, I would say the most significant change is that now everything is in our control. Whether it is the schedule, budget or decisions on the water – it’s all up to Maggie and me to make the best decisions we can with the information we have. And sometimes it’s easy, but sometimes it’s scary because you don’t know what will be the outcome. But we try to take the experiences I had with the top level teams and Maggie’s involvement in the boat and translate them into our program. If you had a magic wand and could make one change at every Olympic sailing boat park what would it be? My change would be to add more education opportunities. There are so many scientists and researchers who can make a huge impact on us with their statistics and data. Many people understand that a reusable bag is better than a plastic bag, but WHY? What are the numbers behind the reasoning? Once we can impact people with the research, then we can encourage them to make bigger changes. How does your role as 11th Hour Racing ambassador fit in with your professional career, and how does it impact your personal life? Personally and professionally it has helped me gain some excellent relationships. It is amazing to connect with someone who is also passionate about making a change. And the best part is learning from all of these people! People like Rachael Miller and Emily Penn are so dedicated to making a change; it is really inspiring! 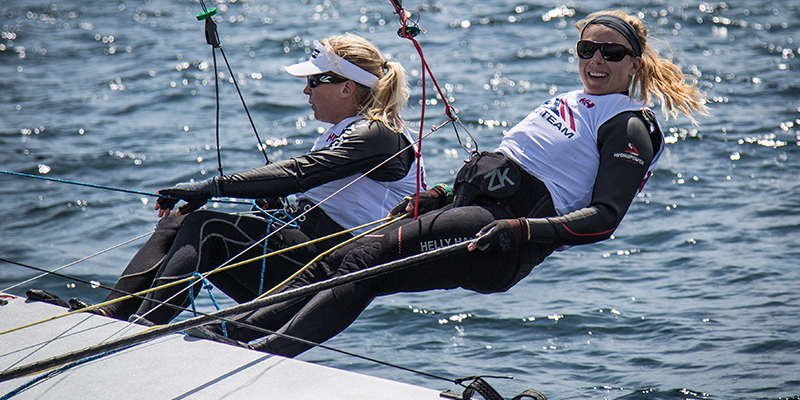 You’ve shared with us before that you are passionate about growing women’s involvement in sailing, how does this connect to your Olympic campaign? I think it’s important for women and girls to feel empowered to set big goals. We have set a huge goal of earning a gold medal. Along with this comes ups and downs that will encourage and discourage you. I hope that mine and Maggie’s determination, persistence and commitment to our huge goal inspires other women and girls to do the same. What event is up next for you? We are now starting our winter training block, which will run October thru mid-January. It is exciting to get back into this mode so we can continue to climb the learning curve. Our next major event is the Sailing World Cup Miami in January on our home turf!! Follow Steph and Maggie on their journey to the Olympics on Facebook and Instagram.